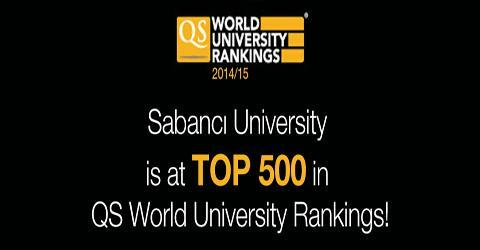 Sabancı University was ranked between 470th and 480th in the QS World University Rankings, one of the most influential university rankings in the world. The QS World University Rankings assesses more than 800 universities around the world based on six indicators in four areas of interest each, namely research, teaching, employability and international outlook. Four of the indicators are based on “hard” data, and the remaining two on major global surveys – one of academics and another of employers. The weight of the indicators based on hard data are 20% for student-to-faculty ratio; 20% for citations per faculty; 5% for international faculty ratio and 5% for international student ratio. The weight of the survey indicators are 40% academic reputation and 10% for employer reputation. Other Turkish universities featured in the top 500 of the QS World University Rankings are Bilkent University, Boğaziçi University, Middle East Technical University and Koç University. Click for QS World University Rankings.